The second half of the twentieth century was dominated by a new kind of conflict; a ‘Cold War’ based on ideological division and fuelled by economic and technological competition. 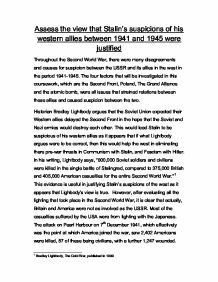 Despite the success of the Grand Alliance between America, Britain and the USSR in defeating Nazi Germany by 1945, their co-operation was little more than a ‘marriage of convenience’ that quickly broke down. The ravages of the Second World War left only two superpowers, and other nations became aligned to either the communist USSR, or capitalist America as both sides attempted to create spheres of influence that would limit the ideological threat posed by the other. The Cold War fuelled bloody civil wars in both Korea and Vietnam and also raised the spectre of nuclear annihilation, particularly during the Cuban Missile Crisis of 1962. Yet these crises often led to moments of genuine co-operation and periods of improved relations, such as during the détente of 1970s. Ultimately though, it was not until the fall of the Berlin Wall in 1990 and the collapse of the USSR the following year that the Cold War could be considered truly over. Get your head around the many figures that were involved in the cold war, from Stalin to Kennedy. What caused the war? Why did it end? 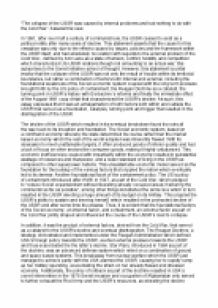 Read our discussion of some important debates surrounding the Cold War to get a better understanding. 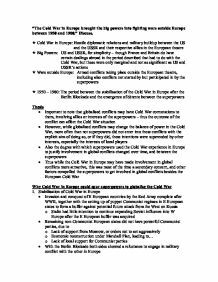 The Cold War in Europe brought the big powers into fighting wars outside Europe between 1950 and 1980. Discuss. 'The west won the cold war.' Discuss this against the backdrop of the internal causes of the collapse of communism. 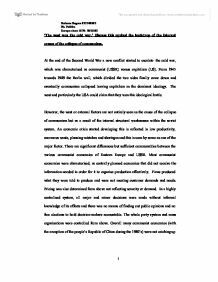 Discuss this against the backdrop of the internal causes of the collapse of communism. At the end of the Second World War a new conflict started to escalate- the cold war, which was characterised as communist (USSR) versus capitalism (US). 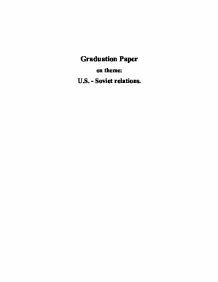 U.S. - Soviet relations in Cold War period. 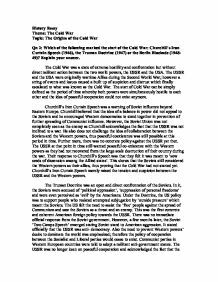 Which of the following marked the start of the Cold War: Churchill's Iron Curtain Speech (1946), the Truman Doctrine (1947) or the Berlin Blockade (1948- 49)? Explain your answer. The collapse of the USSR was caused by internal problems and had nothing to do with the Cold War. Assess this view.